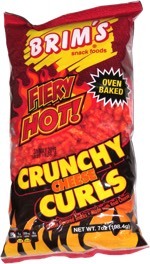 Taste test: These are really excellent barbecue-flavored chips. The sweet barbecue flavor just tastes great, to go along with some excellent potato flavor. The level of flavor powder varies from chip to chip, and if you get one with a lot of powder, there's even a very slightly hot aftertaste. But what stands out here really is the excellent flavoring. Yum! Smell test: Pretty good barbecue flavor with some spice to it. 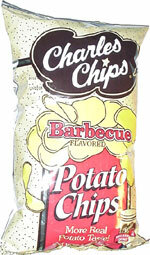 Company: Charles Chips Enterprises, Inc.